Abu Dhabi (WAM) — A major UAE English daily on Oct. 18 commented on the danger of proliferation of nuclear programme, warning that as many as 30 countries could, within a short time, become nuclear states unless serious steps were quickly taken to arrest the situation. 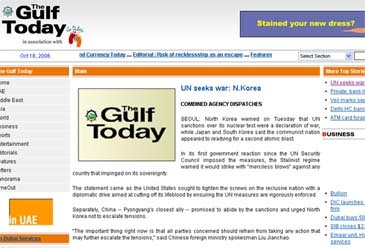 Commenting editorially on the issue today, the Sharjah-based "The Gulf Today" said: "THE warning by the head of the international nuclear watchdog that as many as 30 countries could eventually become nuclear weapon states has added a sense of urgency for efforts to deal with the North Korean crisis and Iran's atomic research. According to IAEA chief Mohammed Al Baradei, the so-called "virtual new weapons states" could develop technology that is at the core of peaceful nuclear energy programmes but could quickly be switched to making weapons "in a very short time." Presumably, apart from Iran, these countries include Brazil, Australia, Argentina, South Africa, Canada, Germany, Sweden, Belgium, Switzerland, Taiwan, Spain, Hungary, the Czech Republic, Slovakia and Lithuania. These countries have the means to produce weapons-grade uranium if they chose or could quickly build such technology. Some of them could use plutonium waste for weaponisation. However, none of them has suggested they want to use their nuclear technology to produce weapons. The international community fears that North Korea's nuclear test last week and Iran's refusal to suspend uranium enrichment could spark a new arms race in Asia and the Middle East. UN officials have mentioned Egypt, Bangladesh, Ghana, Indonesia, Namibia, Moldova, Nigeria, Poland, Thailand, Turkey, Vietnam and Yemen as countries which could be grouped under this category. "On the Korean front, the crisis is only worsening, with reports confirming the North Korean test on Oct.9 was indeed a nuclear explosion, and that US intelligence have picked up signs of activity that raises the possibility that the North Koreans might carry out a second test. This could prompt the US to reconsider its options but it would have to come up with additional and more effective measures to contain North Korea. With China having joined the effort, North Korea could find itself totally isolated, and this raises the question how it would react to such pressure. "Pyongyang has warned that the UN sanctions imposed on it after the first test were a declaration of war. In a toughly worded statement, it vowed not to succumb to pressure and to "deal merciless blows" against anyone who violates its sovereignty. "The key to the crisis is whether North Korea is bluffing when it says it has become a nuclear weapons state and implies that it would not hesitate to use atomic weapons to "defend" itself. Obviously, US intelligence has not been able to come up with a conclusive answer to the question, and hence the focus on the diplomatic front to enforce the sanctions against North Korea. "The world is watching closely how the US will move to curb North Korea's nuclear activities on the one hand and how Washington will confront Tehran, which insists that its nuclear programme is not weapon oriented. "In the immediate term, the IAEA's warning about the "virtual new weapons states" adds to the pressure on the US to act against North Korea and set a deterrent against countries which might be inclined to go for nuclear weapons. "The risk here is that the US, already reeling back from the series of foreign policy failures, might worsen the situation by reckless action as a way out of the crises, and this poses unpredictable consequences whether in Asia or in the Middle East."